Everyone knows that spring is the season for weddings and flowers. We have made a quick list of the three most popular wedding flowers this season. Take a look at what flowers brides are loving for their weddings! From classic neutral arrangements to colorful modern mixes the peony is an all-time favorite for spring brides. Peonies have large gorgeous ruffles that make them stunning in any bouquet or arrangement. Peony season begins in early spring and extends through late June. This beautiful bloom is available in various shades of pink, red, yellow, white, and cream. The hydrangea is a beautiful flower that can be found all over the US during the spring and summer months. It is native to eastern Asian countries such as China and Japan, but it grows well throughout the Americas. The hydrangea is normally a shrub growing about three to nine feet high with lovely blue, pink or even sometimes white flowers. It is possible to find two different styles of this flower. The first and most common type is known as the mophead. Mopheads have large round flower heads resembling a pom-pom or the head of a mop. The other is called a lacecap and has round, flat flower heads with a center core of flowers surrounded by outer rings of showy flowers. Both types can bloom from early spring until late autumn, so it’s possible to see them the majority of the year. Hydrangea is composed of two Greek words: hydor, meaning water and angos meaning jar or vessel. This roughly translates to water barrel, thought to relate to the hydrangea’s need for lots of water as well as its cup-shaped flower. It’s symbolic meaning, heartfelt feelings, comes from Japan, and can refer to both happiness or despair. However, there are other symbolic meanings that have been attached to the hydrangea over the years. Some believe it means vanity and boastfulness while still others claim gratefulness for the recipient’s understanding. It’s important to be aware of all of these meanings when gifting this flower to another so you can be sure and make it clear which symbolic meaning you intend. Of course, you may not intend any symbolic meaning other than that which accompanies all lovely flowers, but it’s important to make that clear as well. The hydrangea is also the 4th wedding anniversary flower. Don’t hesitate to contact your local florist and request this beautiful bloom. Even if they don’t have any in stock, they should be able to get them as part of their weekly shipment! Suggest an Article: Hydrating Hydrangeas! In this edition of Suggest an Article, we have a fantastic tip from Jo Ann Evans of JoAnn’s Flowers and Gifts in Indian Trail, NC. Take it away, Jo Ann! If you aren’t big into cooking, pickling in particular, you may not be familiar with alum powder. It’s a primary ingredient in the pickling of fruits and vegetables to help maintain freshness. 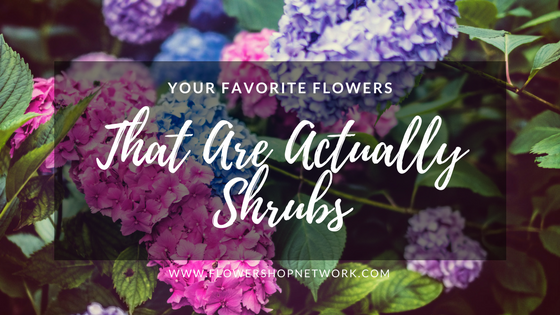 It would stand to reason that if it can keep these items fresh through the pickling process, it could help prolong the life of your freshly cut hydrangeas! Because alum powder is used in cooking, it can easily be located on the spice aisle of your local grocer. It’s a cheap additive to keep Hydrangeas happy, so there’s no excuse not to use it. I hope you enjoyed this edition of Suggest an Article, and I can’t wait to see what kinds of ideas we’ll find in our comments section. Remember, your ideas do not have to be limited to flower care tips or marketing techniques. If you think something is happening in your local community deserving of an article by Flower Shop Network, let us know! Ask The Plant Expert: I planted several Endless Summer hydrangea plants last summer. Most seem to be doing okay, but a few have a brown spot fungus (I think) on the leaves. How do I care for them? Second question: When should I place Aluminum on them to turn them more blue? If you see the spots starting to spread, spray them with a fungicide. Your local garden center will have the right fungicide for hydrangeas. As for care, Endless Summer hydrangeas bloom on both old and new growth – so prune them right after they bloom. Do this by pruning the flower stems back to a pair of healthy buds. Like most hydrangeas they need a slow-release, balanced fertilizer from April through August. Because hydrangeas love a rich well-drained moist soil, it is best to water them thoroughly with time between waterings rather than a little every day. Mulch them well going into winter and during the heat of summer. During the summer, don’t pile the mulch too close to the plant. In late autumn or early spring, you can add aluminum sulfate to the area surrounding the hydrangea to encourage their blue color. To Pot Or Not To Pot New Hydrangeas? Ask The Expert: I received 2 new hydrangeas for Mother’s Day, from a nursery, not foil wrapped. They are both large. I have one other one that was foil wrapped that I have potted and is now flowering (after 20 months). I live in San Antonio, TX, which is hot and dry. I want to know what would be the best option for these new hydrangeas — to plant them or pot them in probably a 15-20 gallon pot each. I would keep them in is partial shade – late afternoon sun, which has been good for my other older hydrangea. Do you have any suggestions on these new ones and what kind of pots, soil, etc? Since you have one hydrangea that is doing well, I would plant the new ones the same way. Hydrangeas typically prefer a well-drained soil with some sun protect in very hot climates. Different varities of hydrangeas can tolerate sun better than others. For example: the oakleaf hydrangea prefers a shady area where as the PeeGee hydrangea like the sun. In Texas, it is best to plant your hydrangeas in rich loamy soil with an eastern or northern exposure (some shade protection could be beneficial, but it will still need a fair amount of sunshine). Make sure to mulch your hydrangeas well to help retain the soil moisture. I hope this information is helpful. Please let me know if I can Help You with anything else. Ask the Expert: Can you paint hydrangeas and put on cake? Hydrangea would not be my choice for cake flowers. If you need to use them begin by hydrating them properly. Without a water source the hydrangeas will curl quickly. So, proper hydrangea hydration is essential. As for painting the blooms, you need to use the right type of paint. You need paint specially designed for flowers. Design Masters’ “Just For Flowers” floral paints come in several different shades. Choose one that has the right tint and test it on one of the hydrangea blooms. This is the only way you will be able to tell if the color will run. Using a paint specifically for flowers is critical. Other paints will not be absorbed by the flower correctly and will cause issues like: blotchy and smearing. This flower design tip is brought ot you by local Phoenix Florists. I have a bride that wants to use hydrangeas in her bouquet and her bridesmaids. I am really afraid of using fresh blooms as I know they wilt quickly. Her wedding is in March. Can you tell me the secret to ensuring that the bouquets will hold up and not wilt. Thank you so much. The first step to ensuring the hydrangeas don’t wilt is the care you give them when they hit your door. Proper hydration is the key. In Hydrating A Hydrangea Bouquet For A Wedding, the steps for hydrating hydrangeas are outlined. 1. Submerge heads for 2 to 4 minutes under tepid water. (You can submerge the heads for up to twenty minutes for significant hydration). 2. Gently shake the bloom heads dry. 3. Recut the stems (preferably under water and at an angle). These steps will ensure that the hydrangeas have been hydrated properly. Now you will need to keep them hydrated and how your store them is the key. Keep the hydrangeas in a high humid environment with very little air velocity. In other words, don’t put them near the cooler fan or door and keep the air around them moist (misting if necessary). Temperature is also a factor; 35 to 38 degrees is optimum. Don’t store near fruit, vegetables or other ethylene gas producers. It is best to create the bouquets the morning of the wedding. However, this isn’t always possible. When you create the hydrangea bouquets leave the stems long enough that the bouquets can be placed in water without getting the ribbon wet (if a hand tied bouquet). Leave the bouquets in water until an hour before the wedding. This process should keep the hydrangeas well hydrated for the wedding and alleviate any wilting issues. Some designers use hydrangeas in floral foam when creating wedding flower arrangements or bouquets. Advanced preparation is still the key in this technique. You will want to cut the stems so that they look like an arrow rather than just a one sided angle cut. Some people recommend using a floral preservative or powdered alum when preparing the hydrangeas, other see no need. You might want to experiment with a couple of stems before the wedding to see which works best for you.